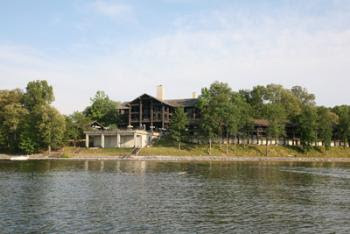 "World-class Lake Barkley lodge, designed by Edward Durrell Stone, seems to have just emerged naturally from the wooded shoreline that surrounds it. Using a post-and-beam wood construction of Western Cedar, Douglas fir, and three-and one-half acres of glass, the recently renovated Barkley Lodge complex provides a lake view from the private balconies of most of the 120 rooms and four suites." "This glass walled 331 seat restaurant allows guests to have panoramic and scenic views from any seat in the house. With Chef Hattie Cheatham’s specialty of good old country cooking like meatloaf, fried chicken, catfish & hushpuppies, with real mashed potatoes, the restaurant has earned a long-time and well-deserved reputation for the best home cooking in western Kentucky. As a supporter of Kentucky Proud program we utilize locally grown meats and produce when available." 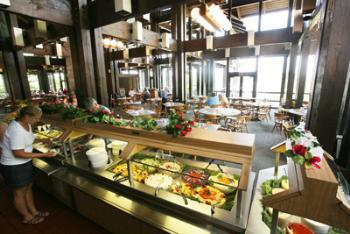 They offer a full buffet for breakfast, lunch and dinner or you may choose selections from their menu. My favorite (or one of my favorites) is the country ham. I adore country ham. If you have never had true country ham, you have to try it if you're ever in Kentucky. It's too salty for some people, but I love it as a special treat! My other favorite is catfish. Served here with lemon butter and seasonings, homemade tartar sauce and hush puppies! Yummy! This is a shot from the lobby of the lodge down to the restaurant on the second floor. And this is from the 2nd floor up to the lobby (sorry for the blurriness). The restaurant has this huge fireplace in the center. They had it decorated for Easter. When I was a little girl and my family would come here for summer vacation, they would have an organ in front of this fireplace and the organist would play during dinner. Today I'm joining Foodie Friday over at Designs by Gollum. Happy Weekend! A beautiful lodge in a peaceful setting. The food looks out of this world good. Thank you so much for sharing this with Foodie Friday. Hope you have a wonderful weekend.